There is no poem here. once foaled six galloping dreams? or if dad ever made it home. Strange, I did hear his voice. or that side of the door. I don’t really know if it matters. One of the many rewarding moments on my trip to the lovely and enthralling city of Krakow this summer was an unplanned visit to the Remuh synagogue and its Renaissance-age cemetery. Founded nearly 500 years ago in the 1550s and used until the end of the 18th century, the cemetery has a remarkable collection of centuries-old stelae, headstones and stone coffins discovered during conservation works. It is surrounded by an outer wall built largely out of unmatched pieces of incomplete gravestones. The site is located in Kazimierz, the old Jewish quarter of the city, very close to the hotel where we were staying, so María and I decided to go with our daughters one morning. As it turned out, later that day we would visit Auschwitz, where, for reasons both hideous and obvious, there are no tombs or graves. So, though unintended at the time, the trip to this graveyard would in retrospect seem fitting and proper, a moment to visit and pay our respects to the ancestors of some of the so many who perished at the death camp. swallowed whole but still wagging. (in the beginning was the word). molten lead and frozen mercury. yet fear I will not sing. Come blow on our ember stones. Written for Tess Kincaid's Magpie ﻿Tales prompt for this week. Click on this link to see the other magpies. Yes, all art is a plea for mercy. is a plea for mercy. yet again that the great arrow is in flight. a fistful of seed hurled at the eternal soil. Yes, all my adult life I have held fast to this modest belief and still do even as I struggle to make it up right here and now. Yet, though I would only discover this later on, this and all other warm fuzzy certitudes suddenly turned to salt stone in that one incalculable instant when I walked beneath a crooked metal arc that muttered in a foul-breathed whisper: “Arbeit Macht Frei”. 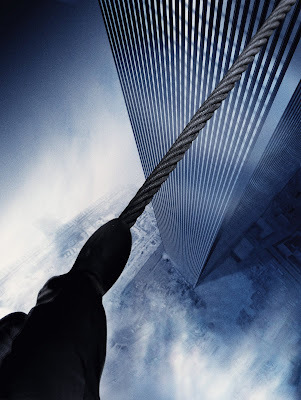 Today, I choose not to remember them as towers of steel or cement or glass. Nor as towers of light in the bugled air. And certainly not as exploding hives or doomed smoldering pyres. No, I do not want to recall how they fell. Today, I prefer to remember them as they swayed, while they swung and rolled the rope under the feet of the beautiful madchild who loved them so. 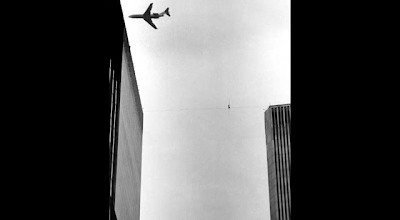 If you have not seen the film Man on Wire documenting high-wire artist Philippe Petit's incredible feat of August 7, 1974, I recommend it and leave some video embeds and links below. Click on the film's name to see the trailer. I recommend viewing the videos in full screen mode and at the highest definition available. 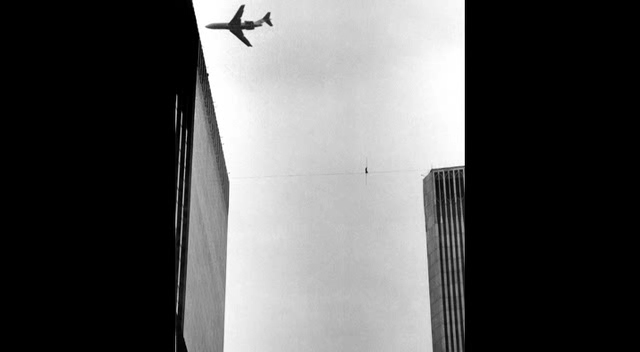 Click on this link to see a slideshow of Petit's astonishing stroll, with Leon Russell singing "Tightrope" as soundtrack. and those who combed the rubble. pilgrims perched on this traceless trail. I have been in the New York area for the last two weeks, working in the City the first week and visiting with my parents and friends in NJ for the last few days, before returning to Spain tomorrow. Ever since I left the US for Spain some 26 years ago, such returns tug my mind and memory in many different directions. "You can't go home again" goes the old truism. 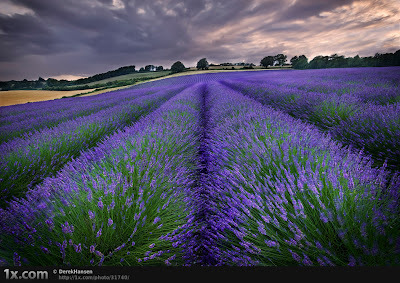 It may be right, but whatever truth it encloses seems to wrong us in our perpetually earnest efforts to travel back across cultures, continents, ages and periods of our lives, to reconnect and mend frayed threads. Many memories welled up today on hearing the sad news that singer, songwriter, musician and poet Gil Scot Heron has passed on, finishing his sojourn here all too soon at just 62, before moving on to the definitive home where we are all summoned to return. Swing in peace, Gil. An alternate reading of the poem by Gil Scot Heron can be heard here. Anyone care to reprise this for the revolution will not be podcast? I spent the better part of Semana Santa (Holy Week) holed up in my translator's den, pounding out an urgent tax law translation — how tediously inappropriate for a week that is celebrated and commemorated like no other here in Spain. Beginning as early as the Friday before Palm Sunday and lasting until Easter Sunday, every city and town and most villages host day after day of processions; plazas and streets fill with the slow somber shuffle of Nazarenos carrying flower-laden floats that bear wooden statues and images depicting scenes from the week that encapsulates the central drama of Christianity. 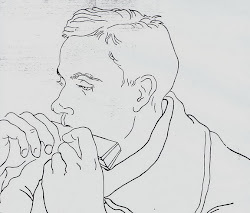 The plaintive sour wail of trumpets and solemn rolling drums are heard everywhere. Some of the processions stretch on until nearly dawn. Descent from the Cross. 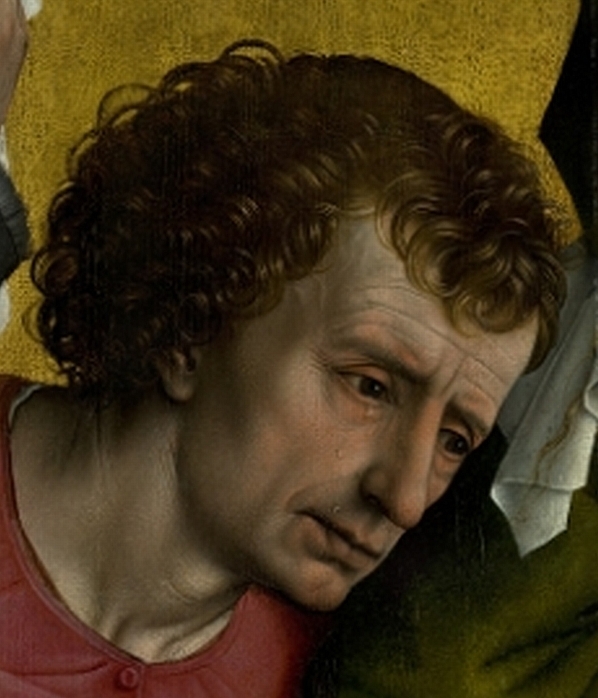 Rogier van der Weyden (1435). Click here for larger full resolution image. 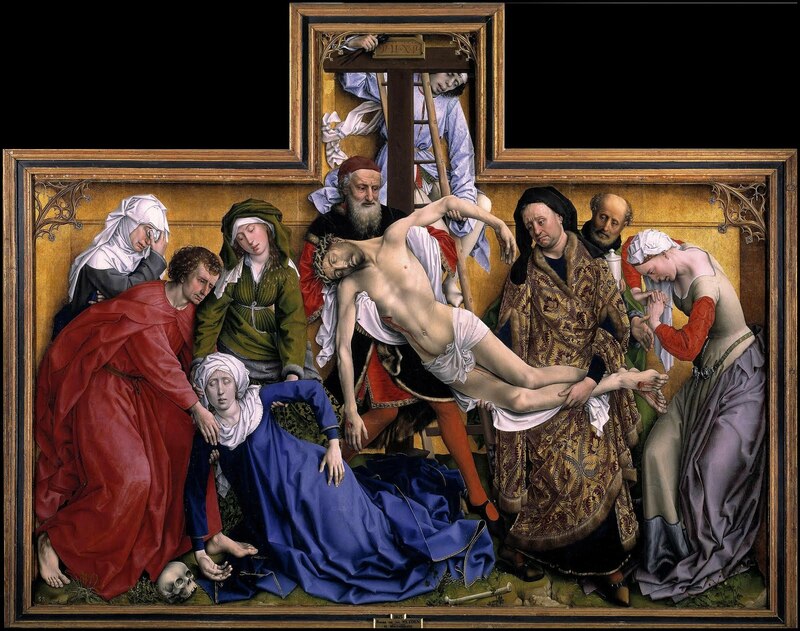 ﻿﻿﻿I was first alerted to the wonders of this painting by a friend of mine who works as a restorer in the Prado. 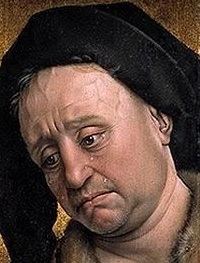 She explained that it is perhaps the best conserved work in the entire museum, in large part thanks to the technique used by Van der Weyden and other Flemish painters of his time of applying layer after layer of translucent paint onto an elaborate underpainting until a near enamel-like effect is achieved. The lapis lazuli used for Mary's robe is also amongst the finest that can be found in any painting from that period. 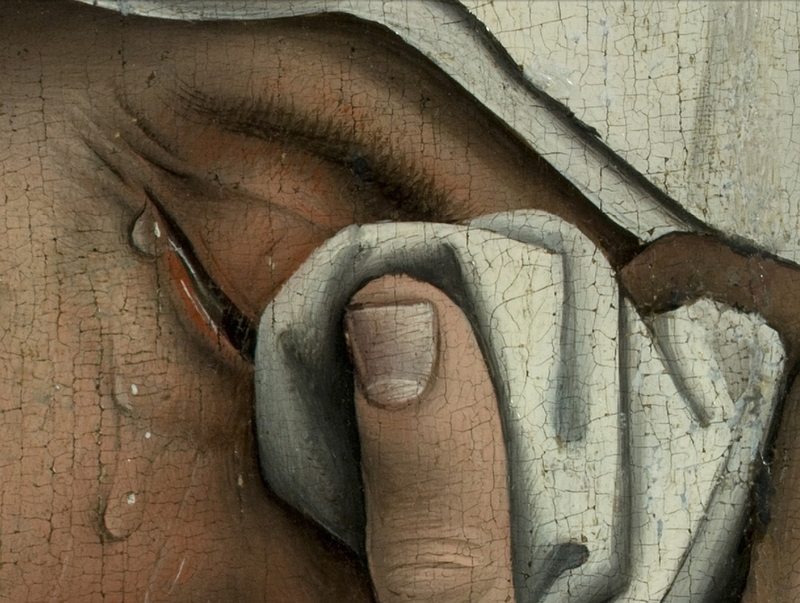 As you contemplate this work, keep in mind that it was painted nearly 600 years ago. It underwent a major restoration in 1992 led by George Bisacca of the Metropolitan Museum of Art. It is quite large, 220 cm by 262 cm (a bit more than 7 feet x 8.5 feet), so the figures are nearly lifesize. 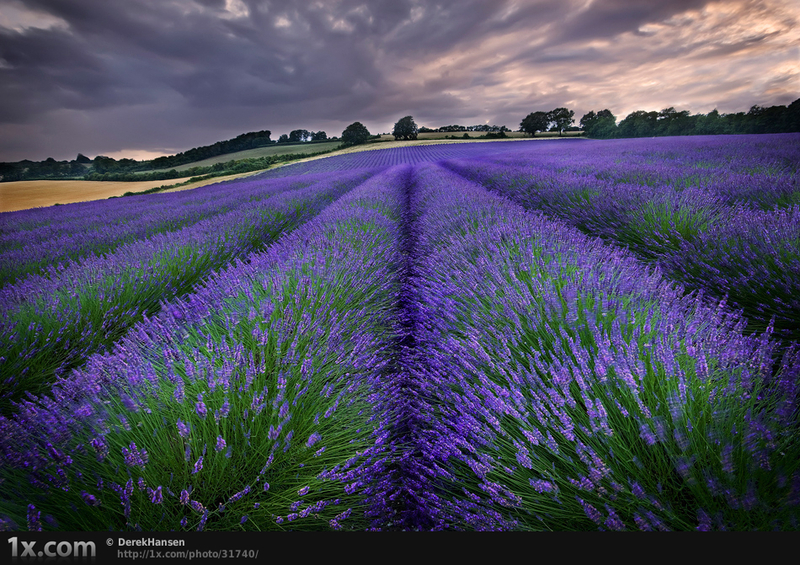 I have sat long and often in front of this scene, stood transfixed by its intense tones and glowing light, paced back and forth along its panorama of pent up pain. The details are simply astonishing. I can think of no other painting that more movingly captures and conveys the contained emotion of the persons represented here, their subdued and tender distress. 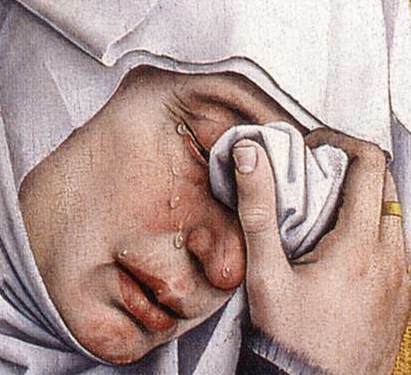 Have tears ever been painted any better than this? See the two embedded videos further below before you answer. 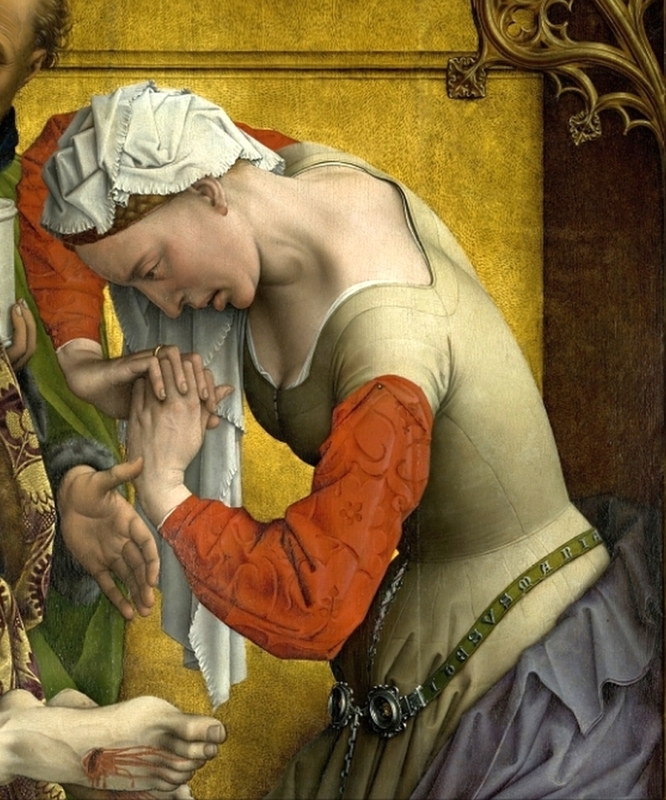 On the right, clasping her hands, the stricken Mary Magdalene is curled by pain and sorrow into an arc of anguish that pairs well with the bowed solicitous figure of Saint John the Evangelist on the other end. He and Mary Salome gently attend to the swooned mater dolorosa sagging down into the deep folds of her lapis lazuli robe. Christ’s limp body is being swathed in fine linen and deposed from the cross by the venerable Nicodemus, the eldest of this congregation and the first to ponder the meaning of to be born again. The descended savior’s legs are held tenderly by Joseph of Arimathea, the man who donated the cave reserved for his own burial so that it be used for Christ’s entombment instead, and whose distrait gaze here seems lost in the cave of Adam’s eyes along a diagonal time tunnel that runs from the skull next to the Virgin’s right hand, through the wounds in Jesus’ hands, to Joseph’s tear soaked face (reflecting the belief that Christ was crucified on the spot where Adam was buried; indeed, Golgotha means the place of the skull). The Virgin Mary and Jesus are at one again, coupled in the supple mirrored waves of their descending bodies, in the helpless fall of their arms, in the pallor of their skin tone — her virginal white further blanched by grief; his blue-grey pall of death somehow become the luminous focus of the painting. A mother and child reunion in their unconscious states: hers, the lapse between fainting and waking; his, the interlude between dying and arising. 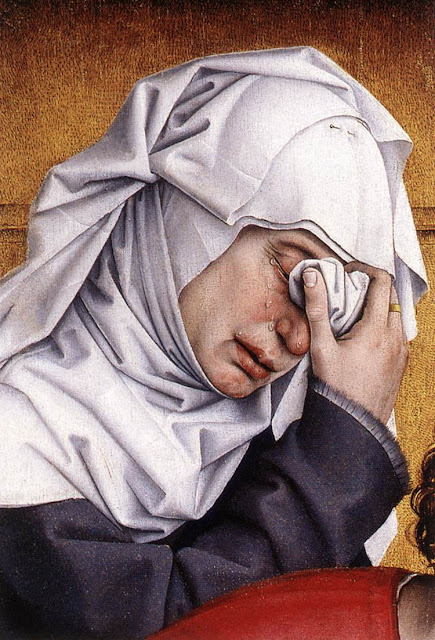 I invite you to see the two embedded videos below to better witness what Van der Weyden has wrought with this masterwork. They come close to capturing the fascination one feels when viewing the Deposition up close. Very close. Do you see the tears move? This second, briefer, video is largely concentrated on the holy woman to the far left, behind Saint John the Evangelist, identified by some art historians and Bible scholars as Mary of Clopas (Cleophas). where birdsong tears the sails of dawn. into a golden nest of muted song. in a throat threshed raw on Calvary stones. was but the cusp of hope? For more information on this painting, I recommend the video and commentary at the always rewarding Smarthistory site, found here. Another closeup exploration of the painting with music is available here. The Prado Museum web page on this work is worth a visit. In addition to a brief description and history of the painting, it also allows you to hear the audio-guide while viewing a high resolution version. It is available here (the play icon there is easy to miss, it’s just above the right part of the cross. On the left side of the image, click on the full screen icon and then use your mouse wheel to zoom in and slide along this epic living altarpiece). 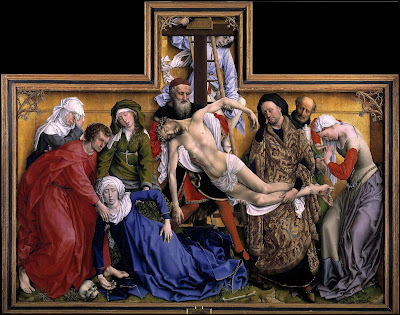 The Prado page also has a link to see the painting in ultra-high resolution with Google Earth. 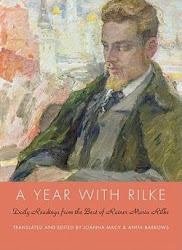 Click on this link to review and recall the A Year With Rilke blog which has now come to a close. Rilke and Rodin — Impermanence wrought in stone and metal?